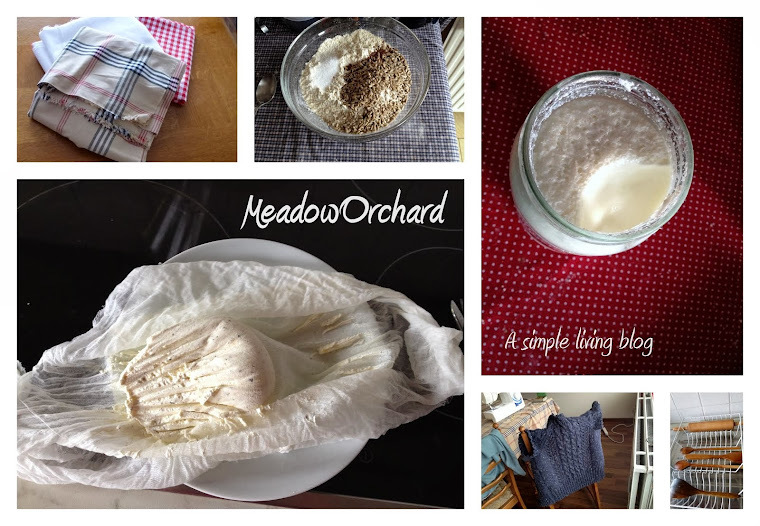 Meadow Orchard: How do you define a simple life? Where is the line? At what point do I qualify as living simply? Reading some of my favourite blog archives, I have been meditating on the question of whether or not I do in fact live a simple life. How is it defined and who decides? I feel that I'm endeavouring to build a simple life, but I don't know if I'm there yet. Does my job (long hours, round-the-clock availability, high pressure, tight deadlines) automatically disqualify me, or does it show that you really can build a simple life regardless of where you are in your life? I've certainly embraced some aspects - making some of my own clothes, household linens and decorations; making cards and gifts; decluttering (or trying to); mending and re-using rather than discarding where possible; using green cleaners. So much seems missing - food preparation and preservation, stockpiling, growing food, keeping animals. We're living busy work-ruled lives in an inner city appartment, not working at traditional crafts close to the land. However, I realised that a lot is missing from this picture because I'm focusing on my simple life, rather than our simple life - myself and my boyfriend. He does most of the cooking - his father is a chef - so it's easy for me to overlook those elements that he takes primary responsibility for. We plan all our meals every week, which helps us control our spending on food. Every meal is prepared from scratch. Every week I look at our supermarket trolley and ask myself "would my grandmother recognise all these food items?" I expect the packaging would horrify her, but I'm confident she'd recognise all the food inside it, bar the occasional more exotic fruit and vegetable items. It's all fresh and dried fruit and vegetables, cuts of meat, basics like flour and sugar, dairy products like butter, eggs and yoghurt, and canned vegetables and pulses. So we're eating real food, and all our meals are prepared from scratch. Even breakfast is almost entirely homemade - toasted muesli, fruit salad or porridge. We've also been exploring the art, or perhaps science, of making jam and preserves. The impetus for this often comes from my boyfriend but it's an activity I enjoy in large part because we can do it together. Perhaps most importantly, though, when you take our life together as a whole, there is a strong focus on spending time together, and with friends and family. We have people round, we go out, we have quiet nights in with pizza and board games, we curl up on the sofa to chill under a homemade blanket. So while there are many check boxes of simple living that we don't tick off, at least not yet, but I think we have the central focus right. I think you're right on track. No one ever does everything. What is everything anyway.? It's different for all of us. You have the right mindset, you're working slowly towards your goals = living a more simple life. Thanks Rhonda. I think I'm on the right track too, I know I'm building the life I want, but I'm never quite sure if the label really fits... I suppose ultimately that doesn't matter.